The Canadian Maple Leaf coin series from the Royal Canadian Mint is among the most popular coins released on an annual basis. Numismatists eagerly anticipate the annual release of the stunning coins each year, and have a great deal of variety to choose from with the coin available in four metals and countless weights. The 2016 1 oz Platinum Canadian Maple Leaf is now available on Silver.com in BU condition. Single coins ship in flips, lots of 10 ship in mint tubes. Issued a face value of $50 (CAD) by the Canadian government. Queen Elizabeth II’s profile on the obverse. Platinum Canadian Maple Leaf coins were originally introduced in 1988 by the Royal Canadian Mint, the same year as the Silver Canadian Maple Leaf. Like the gold variant of the coin, these Platinum Canadian Maple Leafs were available in five total weights. However, that program was suspended in 2002 amid sinking platinum prices and demand. 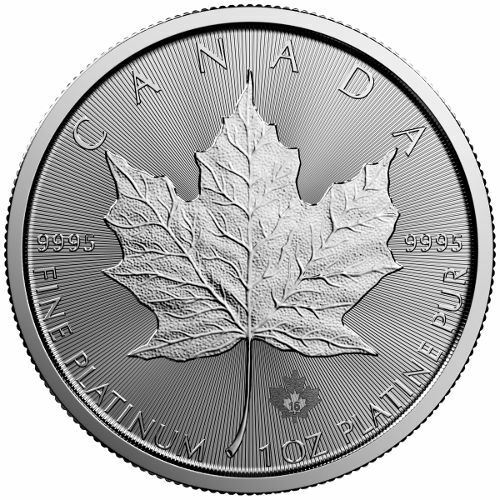 In 2009 the Royal Canadian Mint reintroduced the Platinum Canadian Maple Leaf, and this time only the 1 oz. coin was available. In total, the Canadian Maple Leaf program has coins struck in gold, silver, platinum, and palladium on an annual basis, making it one of the most diverse programs today. Each of these 2016 Platinum Canadian Maple Leaf coins has a Brilliant Uncirculated grade. BU coins have no signs of wear and tear, but do feature minor detracting flaws such as breaks in the luster, spotted surfaces, or contact marks from striking. On the reverse side of the coin is the common sugar maple leaf featured on all coins in the series, as well as engravings identifying the nation of issue, purity, weight, and metal content of the coin. 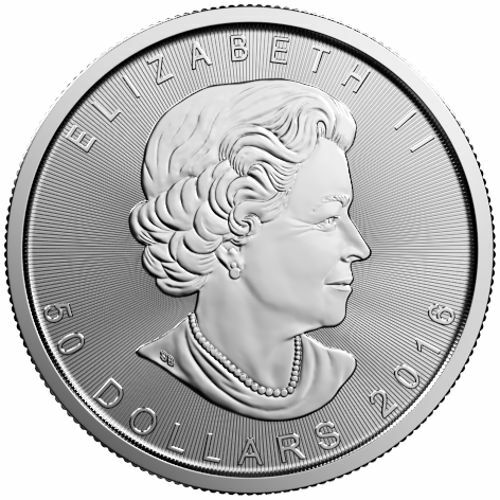 The obverse features the right-profile portrait of Queen Elizabeth II. It was created in 2003 by Susanna Blunt, and is featured along with the engravings of the Queen’s name, the face value of the coin, and its year of issue. If you have any questions for a Silver.com associate, we encourage you to reach out to us. You can contact a Silver.com team member on the phone at 888-989-7223, connect with us online using our hosted live chat, or submit your inquiries in writing via our email address.